Tales of the Trees: Slump of Funk? It seems that here lately everytime I write a post I mention that I am in a "blogging slump or funk." So I vowed to not say that anymore because who wants to continue to hear that over and over again. And then I didn't blog for almost a week because I had absoluetly nothing to say other than I was in a "blogging slump." Back in the day when I was a young, youthful, witty, writer with the world ahead of me, not a care in the world, people would ask me. "How do you find something to blog about everyday?" I would laugh with ease and explain that something just comes to me, whether it was serious, silly, or just plain random something always came to me. And then one day God turned off those serious, silly, or just random thoughts and all that was left was boring, meaningless thoughts. I could tell you about how we have had storms here almost every night and every time I go outside to look at the sky to see if there is a tornado above my house, I see atleast two other neighbors doing the same thing and it makes me laugh everytime. Or I could tell you how I wore leggings to work already TWICE this week and how unprofessional I think that is, but it was raining and I felt I had no other choice. Plus I ate almost a half tube of cookie dough the night before and I had to resort to an elastic waistband. Please don't judge. There could be a story about how running outside is the worst thing ever and my 1 1/2 lung(s?) cannot keep up and most days I want to sit down cry. So instead I come home, sit on the couch, and eat cookie dough out of the package. It soothes the soul. And then I have to wear elastic waistbands the next day. But those would all be boring. In an effort to spark my blogging juices I actually went back to my myspace page (which hasn't been logged into since November) and read my blog from "back in the day." I was bloggin before bloggin was cool. Those posts are the most random, usless, funny stories back from when Luke and I were dating, and it reminded me why I blog. Well I blog for many reasons, but one reason is to remember those funny stories. Even if they only make me laugh. So hopefully some blogging juices will come to me, otherwise my blog will be one of those that was once updated but now sits back in the blogger vault somewhere never to be touched again. Today two years ago I became an aunt. And now today, I am an aunt to the most precious two year old in the entire world. Back then, I had no idea how much I would love that little guy. He is so much fun and keeps us laughing (and constantly moving chasing after him) whenever we are around him. And he only gives me baby-fever a little, teeny, tiny, bit. What a cutie and lucky aunt you are! I can SO relate to the blogging funk. I need some help! Happy Birthday, Maxton!!! LOL, I love his Mickey and Friends shirt. He's blessed to have an aunt that adores him, like you. Love that adorable face of Maxton (& yours too) hehe!!! girl i feel the same way!! i don't update very often but thats ok! it's my blog!! Oh I love being an aunt! SOO fun! No worries! I've been in the same bloggy slump/funk for about a month now (as evidenced by my not posting in forever!). Oh he is a CUTIE!! And BTW, I LOVE cookie dough. It doesn't love my waist, though. Pity. Happy Birthday to precious Maxton! He's such a cutie! Girl, I know the juices will come back to you.. In the meantime its okay to have nothing to say!! Maxton just gets cuter and cuter! As for the blogging, just write what comes naturally. Your life and stories will be interesting because only you can tell them from your perspective. Sometimes I jot down a word or an idea, then I wait awhile before I write it. Just remember inspiration can come from anywhere ! i blog about what i watch on TV. how fun is that? also- i love your random posts. my favorite. no matter how "boring" you think they are, they always make me laugh. -I was wondering where you were when you hadnt blogged in a few days. -Have a kid...that will give you lots to blog about! -Post pics of your house! We have only see a few things yall have done to it! He is too too cute!! Lucky auntie! As for the blogging funk... I think we've all got it right now. What the heck is up with that? Maybe you should just blog every day about the countdown to Eclipse... I mean, that wouldn't be boring - would it? I'm glad you blogged, because I enjoyed reading about the cookie dough and elastic waistbands. For realz, it could have been me writing that. Why is cookie dough so much better than cookies? Oh and those pics of you and Maxton are SO cute - I love them! Happy Birthday to your little nephew! He's adorable!! Even when you have nothing to say you're pretty funny. And by the way...most adorable nephew ever! Oh goodness Megan, he is adorable!! He no longer looks like a baby.. He's full on little boy now! Sorry about your funk. I did not know yo had 1 1/2 lung. What happened if you do not mind me asking. I love how you mentioned sitting on the couch and eating cookie dough out of the package... now that's all I want to do tonight; skip dinner and go straight for the choc. chip cookie dough! YUM! What a cute kiddo!! And it will come back to you. New here...I love your FUNK-Y blog! ;) It's great! you know I love all of your posts, even though you think some might be boring! they never are, you are cute, sweet, fun, and that comes out in every post! you post about anything you want, and we'll be here reading, and smiling! Maxton is adorable, you look gorgeous, and I know I've said it before but he is so lucky to have you as his Auntie! Mmmm, cookie dough. Now you made me want to go buy some and eat it all today- I'm not sure that is a good thing. Maxton is so adorable. I bet he's pretty crazy about his Aunt Megan too! I feel the same way about blogging sometimes and at times I feel like maybe I should just quit and then someone (who may not ever even comment or even have a blog themselves) will tell me they enjoyed seeing my pictures etc. I personally love reading about the simple little things that happen day to day. Keep it up. We all love it. Did you all survive the storms w/out any damage? Wasn't that hail storm last Sun. something else?!!!!! what cute pics of you and your nephew! and keep writing! love your blog! I am right there with ya with the blogging funk girl!! happy birthday to Maxton!! These pictures are so cute! 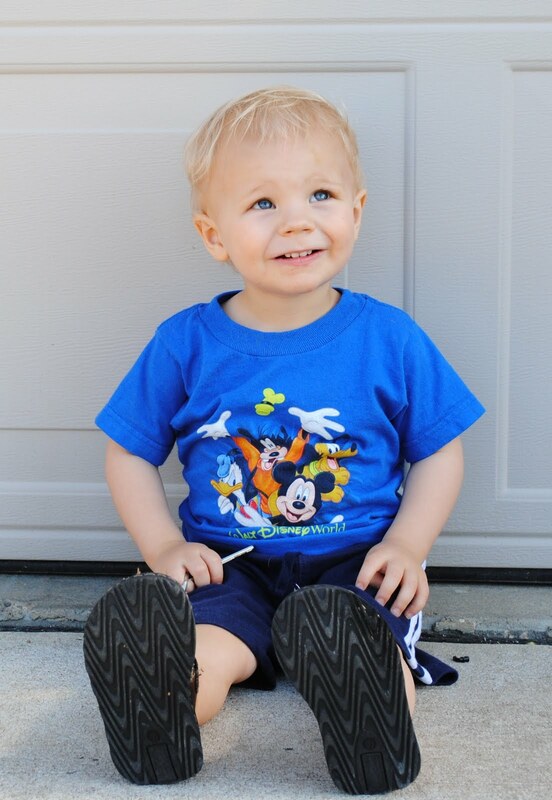 I love his Mickey and Friends shirt.